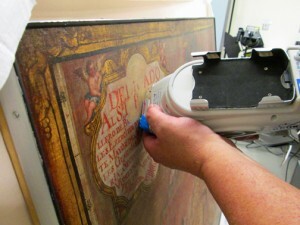 Since joining the Palace of the Governors’ collections in 1977, an 18th-century map painted by Bernardo Miera y Pacheco has slowly but surely revealed its secrets. Thanks to the Museum of International Folk Art’s upcoming exhibition, The Red that Colored the World, we’re learning what types of red paint the master artist/cartographer/politician used. We’re honored that our painting will join the exhibit. Before it does, though, Mark MacKenzie, director of the Museum of New Mexico Conservation Department, wanted to find out what the various reds contained—cochineal, vermillion, iron? In January, he took aim at small portions of the painting with a device that looked like it belonged on the Starship Enterprise. (More on that resemblance in a minute.) 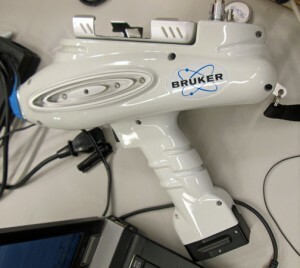 The handheld Bruker XRF spectrometer—a cream-of-the-crop instrument—was recently upgraded for conservation with funding from Don Pierce’s generous bequest to Department of Cultural Affairs entities. The device enables researchers to study the elemental composition of things like paint on a canvas without disturbing even a speck of that paint. MacKenzie was most interested in the red on the map’s compass rose and the hint of it on the arm of a cherub. Pointing the gun-like tool at the compass rose, he held it still for 30 seconds as the X-rays did their work, then watched as a computer screen revealed EKG-like spikes denoting what elements it had found. “Ooh, big iron spike,” he said. On the cherub, he anticipated the glaze-like red to report back as cochineal, which comes from a cactus beetle rather than a mineral. As for that Star Trek device? It was invented by a scientist intent on recreating the tricorders used aboard the fictional Starship. Rather than coming up with a device that can only diagnose health problems, though, he produced something more along the lines of a directed-energy weapon. See an intriguing update, below in blue. On the heels of our recent honor by the National Trust for Historic Preservation, we asked Curator Josef Díaz to offer some insider info about its early occupants. 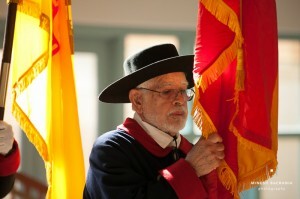 Franciscan friars accused Rosas of encouraging the Pueblo Indians in their traditional religious practices to gain their favor and obtain trade goods. He opened warehouses and sweatshops in the Palace and amassed goods to sell in Chihuahua. In 1641, he was jailed by a pro-Franciscan faction, then murdered in his cell. He and his wife, Doña Teresa Aguilera y Roche, oversaw an extensive remodel of the then-crumbling Palace, adding some 18 rooms, including new living quarters, a courtyard, a torreon and several storerooms. One of his most unusual accomplishments was capturing and shipping five elk to King Carlos II for his private game reserve in Madrid, Spain. 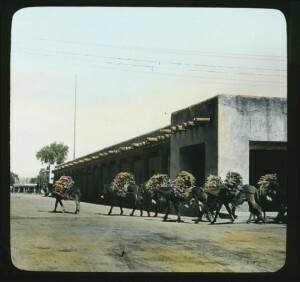 Image above: Lantern slide of burros loaded with firewood in front of Palace of the Governors, Santa Fe, New Mexico, 1915-1926 (? ), by Edward Kemp. 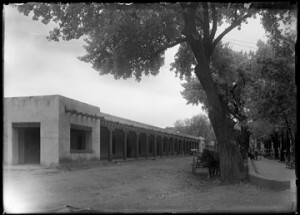 Palace of the Governors Photo Archives LS.1627. 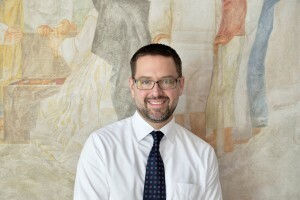 After a national search, Andrew J. Wulf, curator of the Ronald Reagan Presidential Library & Museum, has been named director of our museum. He won’t start until April, but you can start getting to know him now. I was born in Los Angeles in 1971. My parents are Robert, a retired aerospace engineer who worked on black projects throughout my life (Dad can neither confirm nor deny he visited Area 51), and Kathleen, an educational psychologist and professor at USC for over 35 years. I lived in the hills above the Pacific Ocean in West Los Angeles, was a bookworm but also a very physical kid. While my friends surfed, I sat on the beach and read, and read, and read, and read. However, I was also disappearing into the Santa Monica Mountains, rock climbing, looking for snakes, frogs, horned toads. What was the coolest thing about growing up in LA? The coolest thing about growing up in LA occurred by the time fourth grade rolled around. I was already established at Marquez Elementary School, in Pacific Palisades, just two miles from the Pacific Ocean. This was the year the Los Angeles Unified School District began its pilot busing exchange program. Basically, kids from West Los Angeles (where I lived) would be bused to inner-city schools, while kids from East Los Angeles and South Central would be transferred to the west-side schools. This was the year 97 percent of my friends changed from public to private schools. My parents gave me the option of changing too, but they discouraged it. My mother, an educator who had started her career as a history teacher in a racially mixed north LA high school back in the ’60s, recommended I stay in the public system, for it’s the “real world,” a world that both my parents, and my brother, who at the time in the sixth grade, agreed was just as important a part of my world as my predictable environment back at Marquez Elementary. Needless to say, my life did change. I woke up two hours earlier than before. The bus ride was an hour every morning and afternoon. My brother and I, and the few from our core class back at Marquez who decided to participate in the busing program, were the only white kids at Coliseum Street School. Coliseum is situated in the Crenshaw district, south of the Santa Monica Freeway, equidistant from Inglewood in the west and Watts and Compton in the east. As it happened, I loved going there. This room of children seemed more interesting, having a completely mixed group of kids from Japan and Korea, Mexico, El Salvador, while most of the student body was African-American. I just loved playing with the other children my age, especially Billy Cryer, who lived farther east from Coliseum, in “the hood,” as he called it. He was my best friend over the next three years. This entire experience continues to shape my thinking about people, the world, and my place in it. Share some information about your wife and daughter. My wonderful wife, Amparo Valenzuela Wulf, grew up on an apple farm north of Durango, Mexico, and attended a one-room schoolhouse her grandfather built. Moving to the States for high school and university, “Paro” distinguished herself as a professional interpreter and translator for the government and local school districts. Margo Belén Wulf, our six-year-old daughter, speaks fluent Spanish and English, and is learning French as we speak. Her favorite activities are gymnastics (she loves Victory Gym where she trains!) and piano (which she has taken to with great enthusiasm, playing our timeworn, un-refurbished 102 year-old Steinway piano in our family room). What attracted you to museum work? Visiting the King Tut exhibition when it traveled to the Los Angeles County Museum of Art in 1977. I knew then and there that I wanted to be in the arts, culture and heritage business. My family did not have a lot of extra money, but my parents, dedicated travelers, were able to take my brother and me around the world during our childhood, camping in Europe for entire summers, backpacking through India, feeding kangaroos in Australia. This led to my living in Lisbon as a teenager, Paris in my twenties and London and Leicester as a young adult, studying art history at the Courtauld during the summer and working in the membership education programs at the Victoria and Albert during the school year. My favorite museums outside the U.S. are the Maeght Foundation in St. Paul de Vence, the Acropolis Museum in Athens, the Rodin Museum in Paris, and the Gulbenkian in Lisbon. In the United States? NMHM. When was your first visit to New Mexico? My first visit to New Mexico was passing through on the train (I was on my way from LA to Minneapolis) over 20 years ago. Saw mostly rolling countryside but did not grasp, in any sense, the depth of this region’s history at that time. The first quality visit was this last fall when the interview process began for the directorship. From your visits to the History Museum, what artifacts or parts of the campus have most strongly tugged at your heart? I am thoroughly intrigued by each and every aspect of this sensational institution. The Core Exhibit, the Photo Archives, the Chavez Library, the Palace Press, the Portal Program, not to mention the artifact collections and the stellar public programs, are all specific entities that tugged at my heart from the moment I learned of them. I have strong feelings about each of these. As a curator, I am naturally inclined to the primacy of the object. In my experience of research on artifacts of any origin, objects themselves are the main draw for visitors, but documents, rare books, photographs and so forth, capture the intentions of their makers (or subjects) in ways that objects rarely do. As historical evidence, objects can be seriously ambiguous. What parts of New Mexico’s history are you most excited to explore? For my own understanding of this region’s profound history, I would like to both maintain and move beyond the “official” stories, which the museum already quite successfully (and beautifully) addresses in its Core Exhibit. A quote I recently heard doubting/transcending official stories: “Is it possible, in the final analysis, for one human being to achieve a perfect understanding of another? We can invest enormous time and energy in serious efforts to know another person, but in the end, how close can we come to that person’s essence? We convince ourselves that we know the other person well, but do we really know anything important about anyone?” (Haruki Murakami. 2003. The Wind-Up Bird Chronicle, Vintage, London, p. 24). That said, I plan a thorough study trip through all the state’s historical sites with Director Richard Sims. And, closer to home, I plan to draw upon the expertise of NMHM’s deeply talented and knowledgeable staff to point me to stories that have not been told, particularly by individuals and groups whose voices have not been heard. My mentor, Rabbi Levi Meier, a dear friend and Jungian psychologist who passed away seven years ago, gave me this quote from Rilke as a cautionary note against ceasing to understand oneself: “If we imagine this being of the individual as a larger or smaller room, it is obvious that most people come to know only one corner of their room, one spot near the window, one narrow strip on which they keep walking back and forth. In this way they have a certain security.” Following on this personal value echoed in Polonius’s admonition to “Know Thyself,” I am collaborative to the hilt. I promote and expect my staff to claim ownership of their projects. I foster pride in my staff and I expect them to maintain a pride in their work. I’ve got your back. You’ve got mine. I like both together!!! Beats Sriracha, that’s for sure. On January 28, the National Trust for Historic Preservation made official what many of us have long known to be true: The Palace of the Governors is a National Treasure. 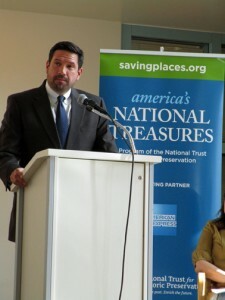 In a special event that included Mayor Javier Gonzales and Cultural Affairs Secretary Veronica Gonzales, the nonprofit organization pulled the Palace into a lineup that includes the likes of Nashville’s Music Row, Theodore Roosevelt’s North Dakota Elkhorn Ranch, and Miami’s Marine Stadium. The listing helps us draw attention to the Palace as we seek $1.5 million from legislators for critical repairs to the building. The Museum of New Mexico Foundation is simultaneously launching a $3.5 million campaign to fund renovations to the exhibits. The Trust noted that Palace construction began in 1610 and serves as a testament to the depth of Hispanic roots in the American story. Barbara Pahl, western vice president for the trust, said she first learned of the Palace in college when an architecture professor dubbed it one of the 10 best examples of architecture in America. “We’re proud to be able to work at your side to ensure the funds are available…now and for future generations,” she said. How can you help? Start by clicking here to electronically declare your support. Then come visit. Pick up a survey at our front desk and share your story of the Palace. Write to your legislators. Show you care by posting a message on your Facebook page. 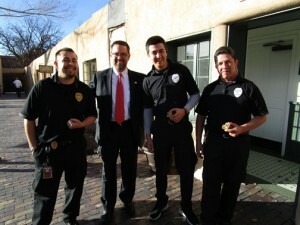 And look forward to “Adobe Summer,” a series of programs we’re developing to deepen everyone’s understanding of the Palace and the Southwest’s greenest, most popular building medium. After the announcement, historian, archaeologists and re-enactors fanned out across the campus to talk with visitors about the Palace. 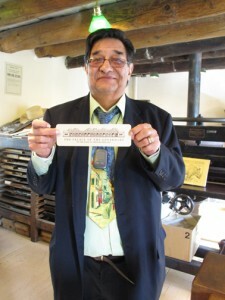 Tom Leech and James Bourland created a keepsake bookmark on the Estancia Press. Los Compadres generously provided refreshments and worked various work posts. We were honored by the support and thrilled at the thought of the new day to come for our favorite National Treasure. 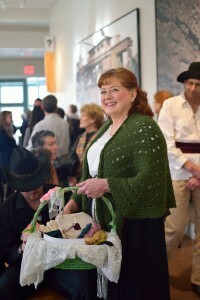 Please enjoy these images taken by Digital Imaging Specialist Hannah Abelbeck of the Photo Archives.